Home Quick Tips How to Use Gmail As SMTP for Email Marketing? Gmail is one of the most simple and feature rich email client. It can be use for sending and receiving emails online on internet. However it can also be use for email marketing, as it allows you to use it a SMTP (Simple Mail Transfer Protocol). Other SMTP charge very high for their services, but you can use Gmail free service for your email campaign. Email Marketing is one of the most effective technique in internet marketing and helps in promoting a product or service. Affiliate marketers are normally using email marketing for promoting the affiliate product to earn from it. Gmail is the available free service that you can use with any email software like SendBlaster, Thunderbird etc.. to send bulk emails. Well of course free services have some limitations, but for a small business where you need to send 500 SMS daily it is the perfect solution. My favorite Email Software is SendBlaster, where I can send bulk emails through HostGator SMTP setting, however it can also be used with Gmail. 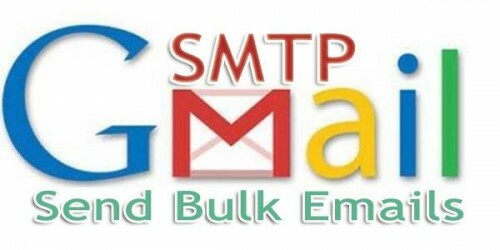 If you want to use Gmail as SMTP then you will need the following information to enter in third party software to send bulk emails. Every email software needs this information, in order to send bulk emails. However make sure that your firewall is not blocking the Port of the software, otherwise it will not let you connect to the Gmail Server. Normally it would not work if you are using a LAN of your collage or university. If you can unblock the port then it will work otherwise you need to use it only from your home internet connection. Now you are ready to send upto 500 Emails through Gmail, but make sure to follow the tips that are needed for effective email marketing. For Example send emails only to your own mailing list, send frequently, allow subscribers to easy unsubscribe from your list in case they are no more interested in your emails etc.